Happy St. Patrick's Day! In kid world, that means wear your green today or you'll get pinched. In my head it gets me thinking about green in the kitchen. I know you've seen on Pinterest, HGTV, and in your design magazines the classic mix of the white with blue cabinets. Whether it's base cabinets in a dark blue, or a navy island, it's everywhere. As much as I do love the classic color combination of blue and white, I think this year we'll start seeing a subtle shift with less blue and it being replaced with a dark, mossy green. Currently in design there's a focus on incorporating nature and nature's colors in our interiors. So this would be a natural fit to have green in your kitchen. As I'm sure you've noticed brass has made a big comeback. 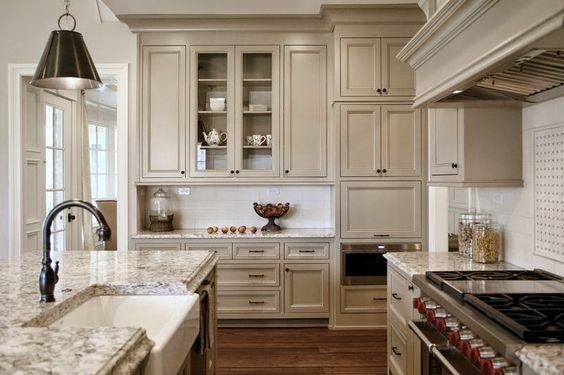 Brass, copper, any of those warm finishes will coordinate perfectly with your green cabinets. In fact, those finishes will actually help accentuate the depth of the green that you've selected for your kitchen. So go on, think outside the box a little, and enjoy these untraditional, but equally special "lucky" kitchens. These are original 1920s arched windows!!! I'll say it again, you just can't get character like this nowadays. And I know I don't need to state the obvious, that wine rack! You should see this before and after kitchen. oh, ok, an art ledge in a kitchen?! sold! This photos sold you hasn't it? The base cabinets and rugs in this kitchen bounce their colors off each other, and highlight each other. I know i've shown this kitchen before, but this is the perfect example of how green and brass meld perfectly together. I bet you didn't look at this photo and think a bachelor lived in it. Who says a bachelor pad has to have a tailored, mens suit feel? This is a nice dark, saturated green that would work in many house settings. Ok, Ok, green lacquered cabinets and that backsplash?! The backsplash kinda reminds me of an updated diner. Still not sure you can pull off green cabinets? Try pulling the color into your backsplash. It's a less permanent option, and usually a less expensive change if you decide in a few years that you really don't like it. I might just have to add green to my kitchen in hopes that it gives me more luck on the cooking front. The fish scale tiles are becoming more and more popular and in this malachite green it really makes a large impact. 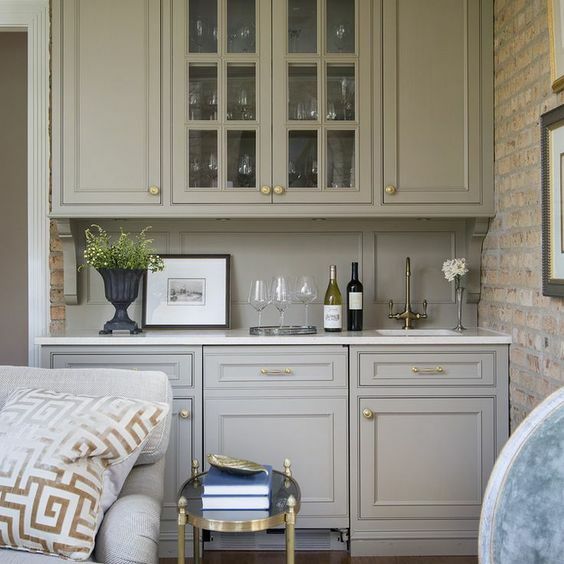 This is a dreamy color and would look nice in many different neutral kitchens. Herringbone is very popular these days, why not spice it up a bit and make it green?! Happy St. Patty's Day! Thanks so much for reading! I'm sure if you've seen Fixer Upper you've seen the episode with Chip and Joanna fixing up a midcentury modern home. This was the first home that they stepped out of their comfort zone and didn't do shiplap. I think Chip and Joanna are cute, and even Brad enjoys the show, but I do love it when they don't use shiplap. It's so refreshing to see something new from them. They redid a midcentury modern home, yet kept the feel of that era, while also keeping it practical and current for todays homeowners. 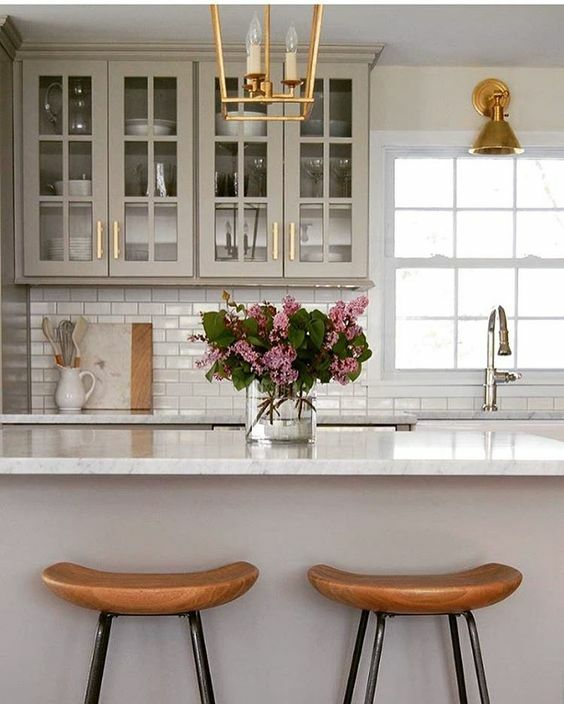 What struck me in the home that they redid was the brass and glass open shelving in the kitchen. The moment I saw that, and knew that millions of others had too, I had a feeling that that style of shelving for the kitchen would soon become mainstream in many other kitchens around the US. Of course Chip and Joanna weren't the first to install these shelves. Many of these kitchens with the open shelves remind me of a Parisian kitchen. Of course brass plays a large part in this style of shelving, but also matte black. One of my favorite examples of this is designer, Lauren Liess' own kitchen. Well the kitchen she had till she sold in Fall of 2015.
how lucky are those new homeowners? Glass shelves are clearly, see what I did there? Wait, is that even funny? Let's pretend it is. So glass shelves provide an airy open feel so when you're tight on space and need that extra storage space this would be the only time I could think to "block" a window. So you're getting storage, still getting sunlight, and it looks good. If you're looking for an easy, instant way to achieve this look Pottery Barn has a beautiful shelf that would look great in many spaces.